Applications that require a high degree of distribution and loosely-coupled connectivity are ubiquitous in various domains, including scientific databases, bioinformatics, and multimedia retrieval. 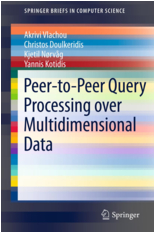 In all these applications, data is typically voluminous and multidimensional, and support for advanced query operators is required for effective querying and efficient processing. To address this challenge, we adopt a hybrid P2P architecture and propose novel indexing and query processing algorithms. We present a scalable framework that relies on data summaries that are distributed and maintained as multidimensional routing indices. Different types of data summaries enable efficient processing of a variety of advanced query operators.